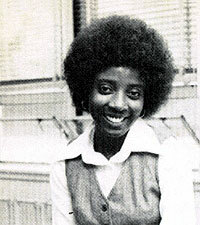 A personal shout-out to Ruby Williams, English teacher extraordinaire! Every year, the day after Thanksgiving is designated as The National Day of Listening. On this day, the public is encouraged to share their personal stories through different media. It's part of StoryCorps, an online oral history project that's broadcast weekly on NPR's Morning Edition. This year, the National Day of Listening is dedicated to teachers. And to that end, StoryCorps is encouraging us all to call a teacher or mentor and have a conversation about the impact he or she has had on our lives. Check out this downloadable guide on a how to conduct a great interview. Share your project on The Wall of Listening. For many of us, our lives have been profoundly affected by the guidance and encouragement of our teachers. I'd like to personally thank Ruby Williams for showing me the joy of writing and setting me firmly on the path to journalism. We'd love to hear from MindShift readers about the teacher who made a big impact on your life. See what others have said about their teachers.